Click link below to read press release. Through the exploration and consideration of sustainable and ethical factors involving over consumption, wastage and animal cruelty within the fashion Industry. This creative research module combined with dissertation research have showcased how these factors are perceived lightly and have become the norm over the course of decades. All factors are hindering the environment and causing unnecessary animal murder. I intend combine and further my research into both wastage and animal cruelty free within the fashion industry. Primarily focusing on how stopping mass consumption of unsustainable and unethical products and promoting vintage, second hand and thrift shops. Through research already conducted a large number of individuals have a lack of knowledge and awareness of what they are purchasing and where it is sourced. Therefore focussing further research on campaigns and how they can better the messages they’re trying to portray. I have begun my research by looking at large organisations, theories and designers. An example of an theory is the ‘circular economy’ in question with whether the fashion industry can ever have minimal wastage with longer more efficient product life cycles. Also through experimenting with controversial images for producing advertising campaigns has helped spur my thought process. With a strong interest in sustainable fashion I think it is vital for more individuals to get involved to stop animal cruelty in fashion but also reducing waste. As a means of research I will look at how fashion brands, designers and media hide the reality of these wastage and animal cruelty. Through my final major project I aim to pinpoint how labels are created; for example fur being perceived as luxury and how cheap products are viewed as acceptable to be thrown away after a handful of uses. This will be the starting point of my primary research done through surveying, documenting footfall in high street shops such as Primark, Zara and Jigsaw through conducting interviews with customers whom purchase from these shops with regards to the clothes they purchase. In this project I have experimented through mimicking animal fur with meat signifying flesh, this informs the viewer that wearing any form of skin or fur is in fact murder of an animal. With supporting slogans and strapless sets the tone of the striking campaign. As part of this current project I have explored aspects of a 360 degree campaign through social media, advertorial posters, press releases and event organisation. Therefore I intend to produce a full 360 degree campaign with a supporting magazine in order to create awareness. I feel that researching these issues in fashion has broadened my knowledge of the brutal, unethical and unsustainable occurrences that are hidden within fashion today. Therefore it has provided me with a deeper insight in the changes I can help create through a 360 degree campaign with a supporting fashion magazine. This will entail relevant articles, information, image making, typography based on animal cruelty and wastage all linking to the 360 degree campaign as these are both sustainable factors. I am for a striking final outcome which will be informative and set a powerful view of how an animals life is wasted due to fashion. My initial research has provided me with a better idea of what I want to explore including questions, themes, theories and collaborative work I will use to formalise my final major project. Both of the sketchbook books linked to this project show research, ideas and development of what I could develop further. This will be useful to relate back too as it has logged my ideas and development process. In order to forward my research and experimentation I need to ensure I am on top of my time management to allow for a smooth development process for my final major project. This can be achieved through GANTT charts and plans. But also frequently visiting galleries and exhibitions. “Coalition To Abolish The Fur Trade.” Caft.Org.Uk, 2017, http://www.caft.org.uk. Gwilt, Alison, and Timo Rissanen. Shaping Sustainable Fashion. 1st ed., London, Earthscan, 2011,. Hendriksz, Vivian. “Anti-Fur Protesters Take London Fashion Week By Storm.” Fashionunited.Uk, 2017, https://fashionunited.uk/news/fashion/anti-fur-protesters-take-london-fashion-week-by-storm/2017091925941. Hethorn, Janet, and Connie Ulasewicz. Sustainable Fashion. New York, Fairchild Books, 2008,. “Indyact | Campagins And Projects | Zero Waste Campaign.” Indyact.Org, 2017, http://www.indyact.org/ContentRecordDetails.aspx?id=75. “The Barbaric Fur Trade | Animals Are Not Ours To Wear | PETA UK.” PETA UK, https://www.peta.org.uk/issues/animals-not-wear/fur-trade/. Continue with research within animal cruelty and wastage – how labels are created and how the medias impact. Begin creating a media pack for the magazine and start looking at one aspect of the 360 degree campaign. Experiment with poster design and magazine layout design. Write feature article on awareness. Print out all work ready for Brighton show and GFW. May 7th Nominees go forwards for GFW and all work finished. Through looking into activism and the different activists who have had a positive impact on society. I came across Artivism which has been developed through antiwar and anti-globalization protests. Artivists use various creative techniques to inform there work in order to express power for social change. 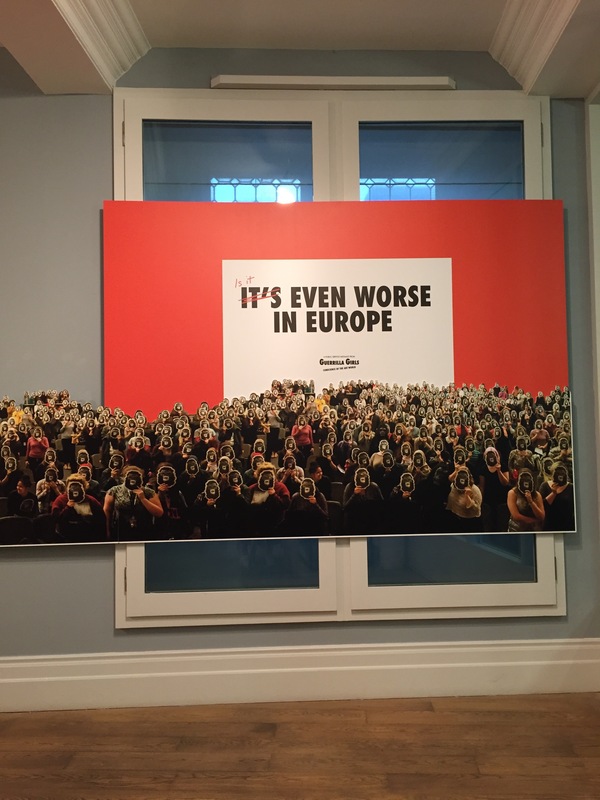 I have started off by looking further into the Guerrilla Girls, whom are female artists that produce wear Gorilla masks in order to fight for human rights, discrimination and ethnic bias. 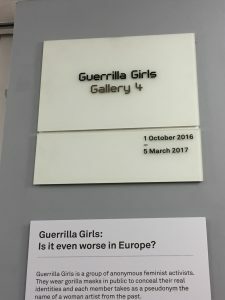 Last year I visited the Guerrilla Girls exhibition at the White Chapel Gallery in London. I initially heard about the Guerrilla girls and was intrigued but the approach they took and how society reacted upon it. Therefore when visiting the exhibition I kept a footfall of the amount of people who entered the gallery and the amount of woman to men. The ratio was 9 females to 1 males for the hour I was in the gallery. 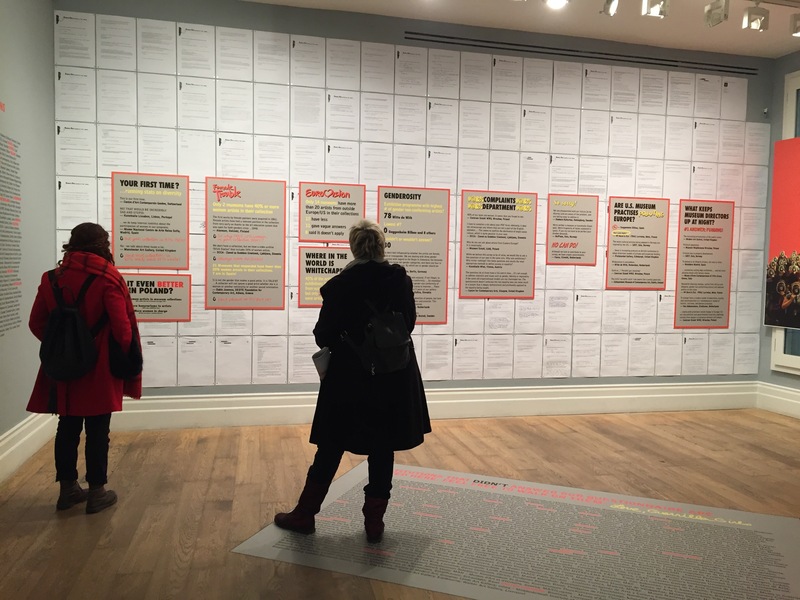 At first this was just for personal interest due to Guerrilla girls being a feminist group; although the Guerrilla girls exhibition at the WhiteChapel pin pointed that men were more likely to be granted an open gallery space in order to support the work they produce. This was very controversial considering it was done in an open gallery on there own walls. Why would men want to visit an exhibition proving how curators can be bias in the artists work they choose to be displayed in galleries? After this weeks briefing I took it upon myself to take a trip to London today. I visited both V&A and Saatchi gallery to try and engage by focus and inspire my ideas into the new project topic ‘Activism’. Reflecting upon attending the Balenciaga exhibition at the V&A, clearly shows how Cristobal Balenciaga is such an influential figure in the Fashion Industry today. 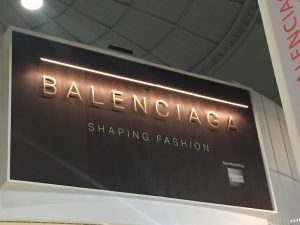 A clear dynamic was visible across Balenciagas garments and how these have been interpreted by contemporary fashion designers today in an innovative way. To find out more information go to the Exhibition page of the blog. After todays first introduction to our new project I felt quite excited about our new research project ‘Activism’. Therefore I went away with an open mind and thought about previous exhibitions/ personal opinions on relevant topics within the topic of activism as well as Activists themselves. After a long summers break and deciding not to take a placement year I have returned to university with a much more positive and healthier mindset. After a wild first year – experiencing Brighton’s nightlife to the full, making new friends and getting to grips with the independence of living alone. I was quite unsure whether to continue with University as I felt like I wasn’t good enough in order to succeed. Continuing on I started an emotional second year which really challenged my emotions and mental health due to living in a distressing environment over the cause of the previous year. This led me to come and go from my hometown, various different friends houses in Brighton which led onto a knock on effect with my academic studies. Therefore struggled to settle down and remain focused. Following on from my previous experiences I took it upon myself over the summer break to think about all the positives and negatives of what I have learnt and developed at university. Focusing more on the positives an how these could be developed further I realised a placement was not for me as it may of had a strong influence in not returning to university all together. After realising about my return I ensured I was fully prepared for my return and surrounding myself with good, positive people who influence me to crack on with work (My girl group who helped me get through second year.) Also my aim is to keep up with my gym routine as I have always been a fairly active person, going to the gym or for a long run really motivates me and allows me to have a clearer head in order for a more practical and efficient day. Drinking alcohol only at the weekends is also another big aim as I gave a very low tolerance to it therefore my ‘hangovers’ are extremely unpredictable and can leave me feeling in for a few days. In order to succeed in the year ahead I need to remain focused on what I want to achieve and accomplish before finishing my degree.